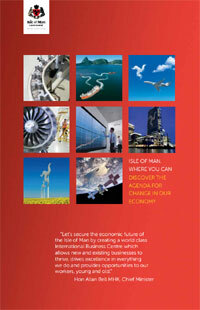 The Department of Economic Development has outlined Governments strategy to further develop and diversify the Isle of Mans economy over the coming year. Details of the Departments key objectives and priorities have been published in a new 17 page document entitled Discover the Agenda for Change in Our Economy. Starting with a foreword from the Chief Minister Allan Bell MHK the document details the Isle of Man Governments plans to drive economic growth, alongside its other priority areas of balancing the budget and protecting the vulnerable. Economic growth is detailed in the document as being derived from the core areas of Financial Services, Established Sectors such as Manufacturing and the Visitor Economy and Emerging Sectors such as e-Gaming and Clean Technology. "I believe that our plans to develop the economy will enable us to deliver increases in income generation and job opportunities, which will benefit both residents and businesses in the Isle of Man. Although we have a firm foundation of 30 years continuous economic growth, with the economy likely to grow by a further 4% in 2013, we operate in highly competitive and challenging times. It is therefore important that we provide as much reassurance and clarity to the business community and general public as possible about our strategy and plans for delivering a successful economy." We will continue to prioritise our resources and work as closely as practicable with businesses on the Isle of Man as we know that this excellent working relationship truly benefits the Island.